The Society is sad to announce the passing of Albert Turner at the age of 101. 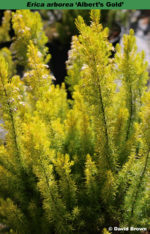 Albert discovered and propagated Erica arborea ‘Albert’s Gold’ (description and illustration within this website) and the cultivar was subsequently introduced into cultivation by Denbeigh Heather Nurseries by 1975. After Albert celebrated his 100th birthday, in June 2016, the Society was delighted to place a “news” item on this website and to feature a photograph of Albert on the front cover of the 2016 Autumn Bulletin including a few words from Albert’s grandson within that same Bulletin. The Heather Society wishes to extend sincere condolences to Albert’s family, for their sad loss. The Society is very saddened to announce that Honorary Member, Ron Cleevely passed away, at his Devon home, on 26 February 2017. Ron joined the Society in 1971 and soon became a stalwart member, especially indexing the Yearbooks (from 1963 through to 1993). In 1982, in recognition of his indexing work, Ron was made an Honorary Member of the Society. He also belonged to the Cape Heath Group, and he and Ros attended the party at Dr Violet Gray’s garden, Hindhead, in 1973 (Heathers 2: 38). Ron was Assistant Editor of the Yearbook from 1994 to 2001. 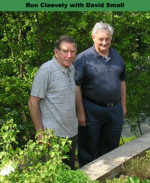 Ron became a Member of the Council of the Society in 1994, a position which he retained until 2001. In 1997 he was elected Hon. Secretary, retiring in 2001. The Heather Society wishes to extend sincere condolences to Ron’s wife, Ros Cleevely, for her sad loss.